Water and Tomato paste, Juice of: carrots, celery, beets, parsley, lettuce, watercress, spinach, with Salt and Seasoning. 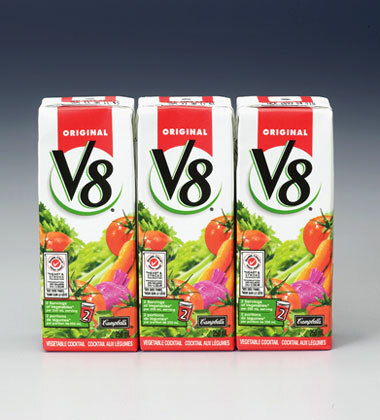 A delicious blend of eight vegetables combined to create a low calorie, nutritious and refreshing beverage. Natural Source of Beta Carotene. Two full serving of Vegetables. Only 52 calories. No sugar added. No additives or preservatives. 18 mg of Lycopene. Recommend use by date on container. Promptly refrigerate any unused portion.